At the end of this week, you'll reach your due date. There's a lot to keep in mind regarding labor and delivery, and reviewing this information can help you ensure you're prepared for the big day. According to the Mayo Clinic, babies' weight and size can vary significantly at the time of birth. Most babies are anywhere from 18 to 20 inches long from head to toe, but your little one may be shorter or longer than average. He will probably weigh between six and nine pounds. Your baby's size is dependent upon a number of factors, including your own weight, his birth order, and his gender. On average, baby boys will be slightly heavier at birth than baby girls. At this point in your pregnancy, your baby's bones have all hardened, with the exception of his skull. The skull remains pliable to help your baby come through the birth canal. If you are a first-time mom, you may wonder how you'll know when you are in labor. Fortunately, there are a few indicators that will let you know when the big day has arrived! You may already be experiencing some of the earliest labor signs, including effacement of your cervix and loss of the mucus plug. If you have any concerns about your symptoms, it's best to err on the side of caution and contact your healthcare provider. Don't let your own fear or embarrassment keep you from making it to the hospital in time. According to KidsHealth, only about 10% of women experience their water breaking as the first sign of labor. Also known as "rupture of membranes," this results in a gush or trickle of clear amniotic fluid. Knowing what to do when your water breaks is important: you should call your doctor or midwife to discuss next steps. If the fluid is green, brown, or yellow, contact your healthcare provider immediately. This may be a sign of infection or that your baby has passed meconium also known as baby's first bowel movement. At this point in your pregnancy, you may notice contractions that feel like heavy menstrual cramps or gastrointestinal upset. The pain may be centered in your lower abdomen or also felt in your back and legs. At first, it can be difficult to tell the difference between Braxton Hicks contractions and real labor. If the contractions appear at regular intervals, last longer than 30 seconds, and become increasing painful, real labor has probably begun. By week 40, the waiting can seem endless, and you may be in a hurry for labor to begin. 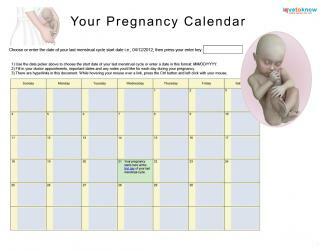 It's important to keep in mind that your due date is an estimate and that many women go a week or two past that date before they give birth. Acupressure sometimes works to induce labor. Natural labor-induction methods like eating spicy foods may or may not work. Walking may help induce labor or speed it along. Herbal remedies may also help induce labor, but they often have side effects. If your labor has not begun and your physician feels it's time for the baby to be born, he may use drugs to induce labor. Learning about the side effects of these drugs is part of being an informed patient. Be sure to ask your doctor if you have any questions. Childbirth can be divided into three general stages: labor, pushing and delivery, and delivery of the placenta. Understanding these stages and how they may affect your birth experience is important before you go into labor. The labor phase involves early labor, active labor, and transitional labor. This can take place over a period of several hours. It ends when it's time to begin pushing. During pushing and delivery, you are an active participant in the birth experience. Typically, this stage lasts between five minutes to three hours or more if you have an epidural. This stage ends with the delivery of your baby. The final stage of childbirth is the quickest part of the process. Now that you've already seen your baby for the first time, you'll need to deliver the placenta. This typically takes between five and thirty minutes. Afterwards, your doctor will complete any necessary stitching from natural tearing or an episiotomy. Whether you give birth on your due date or a week or two later, your life is about to change. Congratulations on becoming a mother, whether it's for the first time or the tenth!